Welcome to our NHL Sportsbook Reviews page for Canadians. Here you can read more about each sportsbook and click for a full review of each if you wanted more info. The best odds? Pinnacle. The most betting options and a good signup bonus? Sports Interaction. The best live betting and a great option for Proline players? Bet365. The easiest funding methods and tons of NHL props? Bodog. Make sure you read our NHL sportsbook reviews for Canadians below to find out more about each option. 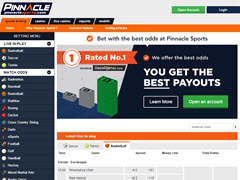 Pinnacle Sports currently tops our list of best Canadian sportsbooks. Canadians are welcomed at virtually every major online sportsbook in the world and therefore are in the fortunate position of being able to play where unique value is offered. Pinnacle Sports offers unbeatable odds on NHL games and therefore is a must-have account for sports bettors in Canada. Pinnacle also offers a Canadian dollar betting account, all the popular deposit and withdrawal options, and one free withdrawal a month. Read our full review for more information about this popular sportsbook for Canadians. Sports Interaction is the best online sportsbook located in Canada and thus targets this market pretty much exclusively. Licensed for nearly 20 years now the sportsbook just seems to get better each year. NHL bettors love the 100% instant cash bonus and endless hockey betting options the sportsbook provides. Since Sports Interaction is a Canadian sportsbook players are able to wager in our currency and have access to the best deposit and withdraw options. Bodog was founded by Canadian Calvin Ayre and thus has always catered well to Canadian sports bettors. 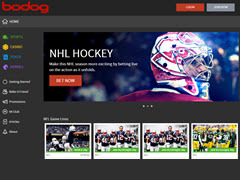 Bodog is a big brand and they are great for offering players a large variety of NHL betting options. Canadians can wager in local funds and Bodog offers some of the best and easiest funding options for Canadians including bank transfer and even Interac email transfers. Bodog also offers a free withdrawal once per calendar month on most withdrawal options.